"Quintana 30 is located in Moncloa neighborhood, opposite the West Park one of the natural lungs of Madrid, where the Temple of Debod is located and one of the most unique attractions in the city of Madrid: the cable car. 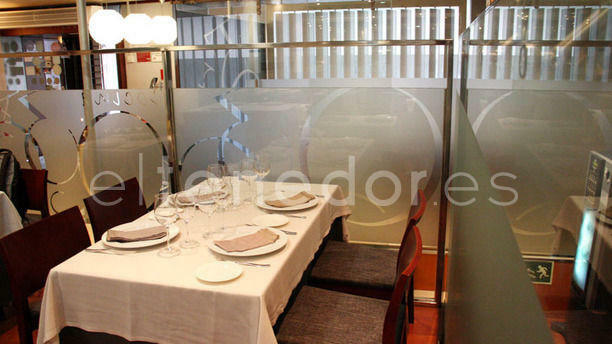 Close to the biggest reference points of the historic center, this restaurant offers excellent seasonal Basque-Navarre cuisine. Miguel Angel Muñano and Mercedes Rodríguez, are not only partners and co-owners but they are also responsible for heading this project, together with a large team of professionals, both in the dining room and kitchen. Quintana 30 offers a distinguished and cozy atmosphere with modern decoration and refined lines, taking care of every detail to provide at all times the highest quality and service. The restaurant has a private space with capacity for 8 people. Book and discover the quality!" Scallops good as was steak. Scallops & cod very good. As out first dinner in Madrid, it was perfection. Two days in and still the best to date. Wine list creative, service patient and kind with our limited spanish, and dishes divine. My daughters risotto was perfection and each shared dish a delight!